Arrhythmogenic right ventricular cardiomyopathy (ARVC) is a genetic disease in the Boxer dog and has also been called Boxer Cardiomyopathy; rarely other breeds are affected. This disease most commonly causes heart arrhythmias that can result in episodes of collapse or fainting and even sudden death. Arrhythmogenic right ventricular cardiomyopathy (ARVC) is a genetic disease in the Boxer dog and generally will develop in middle age (5-7 years of age). This disease affects the heart muscle and causes replacement of the normal heart muscle with fatty and fibrous tissue. This change causes electrical instability in the heart muscle resulting in arrhythmias. An arrhythmia is an irregular heart rhythm and this can often, but not always, be detected on a physical examination in affected dogs. The specific arrhythmia with this disease is called ventricular premature complexes (VPC), these are early abnormal heart beats originating from the heart muscle instead of the specialized conduction tissue in the heart where normal heart beats originate. If VPCs are strung together an arrhythmia called ventricular tachycardia occurs and can result in symptoms. A genetic deletion in an important heart gene (striatin) has been identified in Boxers and it seems that up to 40% of Boxers have this genetic mutation. This genetic mutation has a characteristic called “incomplete penetrance”, which means that even if a dog has the mutation it may not penetrate and result in development of the disease. A DNA test can determine if a dog has the mutation. Even if your dog is negative it does not mean that it will never develop heart disease or an arrhythmia. In people there are many genetic causes for the disease and this could also be the case in Boxers. The most common symptoms of ARVC are episodes of collapse or fainting, this is called syncope. Some dogs will die suddenly and this may be preceded by episodes of syncope or this could be the first symptom of the disease. A small proportion of dogs will develop heart muscle failure that could lead to signs that include shortness of breath, coughing, exercise intolerance and difficulty resting comfortably. Some dogs have no symptoms of the disease and it is identified incidentally. Patients suspected of having ARVC should have a thorough physical examination and diagnostic procedures including an electrocardiogram (ECG), blood pressure measurement and an ultrasound of the heart (echocardiogram). In order to best evaluate the severity of the heart arrhythmia most dogs will have a Holter monitor performed. A Holter monitor is a 24 hour ECG that is worn at home and allows the cardiologist to evaluate the heart rate and rhythm during normal activity. This is also performed to evaluate the efficacy of treatment. The treatment for ARVC will depend on the severity of the arrhythmia and other findings from diagnostic testing. If the patient has severe arrhythmias then a medication called an antiarrhythmic may be recommended with the goal of controlling or improving the arrhythmia. This type of treatment requires monitoring to ensure that it is being effective and the treatment may be changed depending on that particular patient’s response. Many Boxers with ARVC can live a number of years without symptoms and may potentially even have a normal life span. However, these patients can develop episodes of syncope, develop congestive heart failure with coughing and shortness of breath or experience sudden death. Treatment is given to try to control the heart arrhythmias, prevent or control syncope, try to prevent sudden death, and control congestive heart failure if appropriate. In patients diagnosed with ARVC that are asymptomatic for the disease recheck ECG and/or Holter monitoring, and echocardiograms are generally recommended at regular intervals to assess need for therapy, changes in therapy and progression of disease. In symptomatic patients Holter monitoring or other testing may be more frequent until the patient is stabilized. 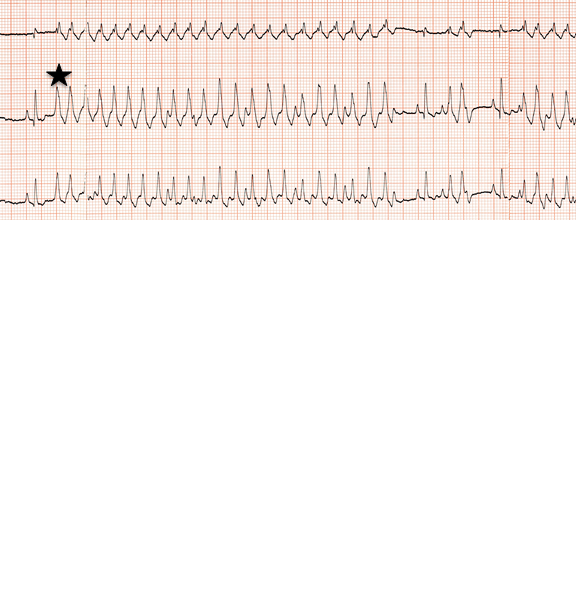 This is an ECG from a Boxer with arrhythmogenic right ventricular cardiomyopathy showing individual ventricular premature complexes indicated by the thin arrows. 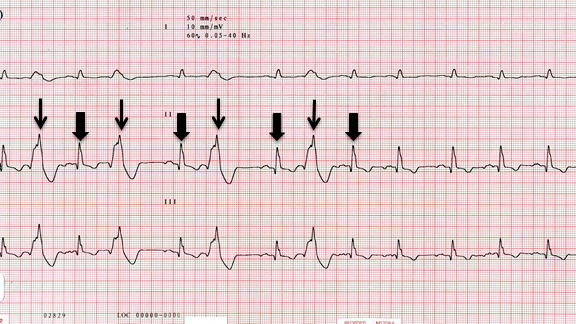 The thick arrows are showing the normal heart beats as identified on an ECG. This is an ECG from a Boxer with arrhythmogenic right ventricular cardiomyopathy with a severe ventricular tachycardia where the ventricular premature complexes are strung together. The start of the ventricular tachycardia is indicated by the star and is preceded by a normal heart beat.